We investigated associations between metabolic factors and blood cancer subtypes. Data on body mass index (BMI), blood pressure, blood glucose, total cholesterol, and triglycerides from seven prospective cohorts were pooled (n = 578,700; mean age = 44 years). Relative risks of blood cancers were calculated from Cox regression models. During mean follow-up of 12 years, 2,751 incident and 1,070 fatal cases of blood cancers occurred. Overall, higher BMI was associated with an increased blood cancer risk. In gender-specific subgroup analyses, BMI was positively associated with blood cancer risk (p = 0.002), lymphoid neoplasms (p = 0.01), and Hodgkin's lymphoma (p = 0.02) in women. 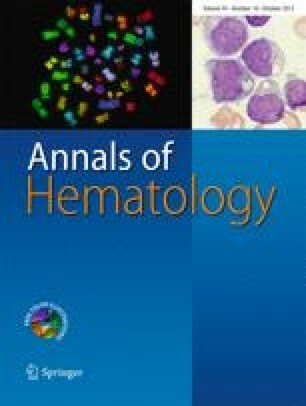 Further associations with BMI were found for high-grade B-cell lymphoma (p = 0.02) and chronic lymphatic leukemia in men (p = 0.05) and women (p = 0.01). Higher cholesterol levels were inversely associated with myeloid neoplasms in women (p = 0.01), particularly acute myeloid leukemia (p = 0.003), and glucose was positively associated with chronic myeloid leukemia in women (p = 0.03). In men, glucose was positively associated with risk of high-grade B-cell lymphoma and multiple myeloma, while cholesterol was inversely associated with low-grade B-cell lymphoma. The metabolic syndrome score was related to 48 % increased risk of Hodgkin's lymphoma among women. BMI showed up as the most consistent risk factor, particularly in women. A clear pattern was not found for other metabolic factors. The online version of this article (doi: 10.1007/s00277-012-1489-z) contains supplementary material, which is available to authorized users. We thank: in Norway, the screening team at the former National Health Screening Service of Norway, now the Norwegian Institute of Public Health, the contributing research centers delivering data to Cohort of Norway and Hilde Koch Lie research assistant at the Cancer Registry of Norway; in the Vorarlberg Heath Monitoring and Prevention Programme, Elmar Stimpfl, data base manager, Karin Parschalk at the cancer registry, Markus Wallner, Christian Bernhard, Andrea Kaufmann, Gabriela Dür from the Vorarlberg State Government, at the University Ulm, Andrea Kleiner, Daniela Oesterle, and Jürgen Salk for their excellent technical assistance; in the Västerbotten Intervention Project, Åsa Ågren, project data base manager at the Medical Biobank, Umeå University, Sweden; and in the Malmö Preventive Project, Anders Dahlin, data base manager. We gratefully thank the bwGRiD project (member of the German D-Grid initiative, funded by the Ministry for Education and Research and the Ministry for Science, Research and Arts Baden-Wuerttemberg. http://www.bw-grid.de 2010) for the computational resources. This work was supported by the World Cancer Research Fund (Grant 2007/09).